It gets hot in Melbourne, hot enough that the tar on the road bubbles and your eyes dry out. Walking around the city you need a drink and the all time favourite drink in Melbourne is water. With the ubiquitous bottled water you might think that there are no drinking fountains in Melbourne but there are drinking fountains all over the city, from the antique to the ultra modern. The Duke & Duchess of York Memorial Drinking Fountain, 1901, corner of Elizabeth and Victoria St.
I’ve been looking at Melbourne’s drinking fountains; researching the history of Melbourne’s drinking fountains, testing which ones are still working and surviving without a water bottle. There is more to it than taps and bubblers, there are decorative drinking fountains and strange organizations like the Independent Order of Rechabites and the Anti-Sweating Labour League of Victoria. Since ancient times a city’s prestige has been measure by the quality of its public fountains. The fountains tell a history of the city. In the 1850s the Melbourne City Council was loath to erect drinking fountains, as publicans dominated the council. The earliest drinking fountain in Melbourne is the Victoria Fountain, opened 9th August 1859. It was erected in the centre of Collins and Swanston St. surrounded by bluestone kerbing and iron railings and was used by both people and horses. In the 1860s the lamp pillars in the city had water taps and ladles. Horses had their own drinking troughs and there are still a few operating water troughs around the CBD. The earliest of Melbourne’s proper drinking fountain still in use is the 1876 Wilkinson Memorial Drinking Fountain at Nelson Place in Williamstown. It is a rare surviving example of an imported cast-iron ornate drinking fountain manufactured by Walter Macfarlane & Co of Glasgow. 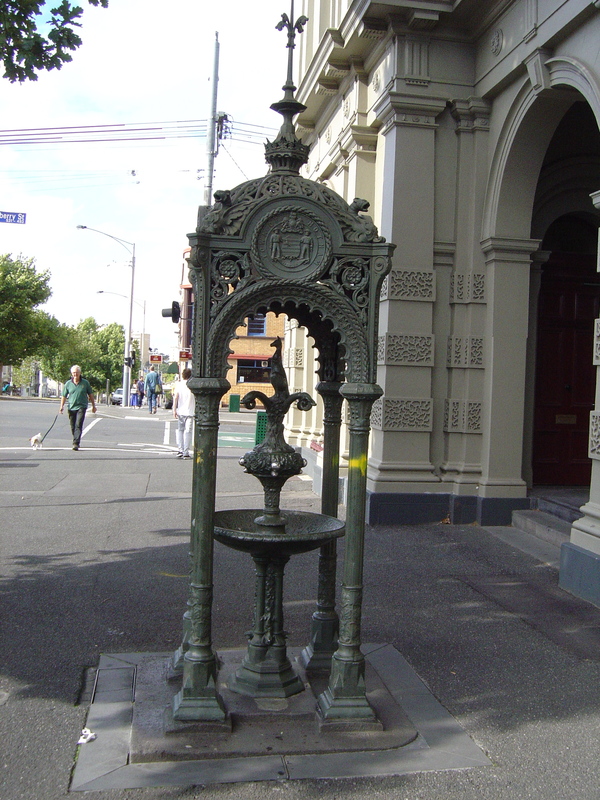 The only other one other cast-iron drinking fountain known to still exist in Victoria is the Henderson Memorial Drinking Fountain in North Melbourne. It was presented by the former mayor Thomas Henderson and was originally sited at the intersection of Errol and Queensberry Streets. In 1889 it was moved to make way for the cable-tram tracks and it moved again in 1917 to the footpath. In 1972, a vehicle collided with the fountain, badly damaging its canopy. In 1973 it was moved to its current and safer location outside the North Melbourne Town Hall and in 2001 a duplicate of the canopy was added – including the small figure of a kangaroo. Changes in Melbourne’s traffic have had a big impact on drinking fountains making them less ornate. The granite Thomas Ferguson Memorial Drinking Fountain from 1912 was originally six meters high and far more elaborate than it is now. 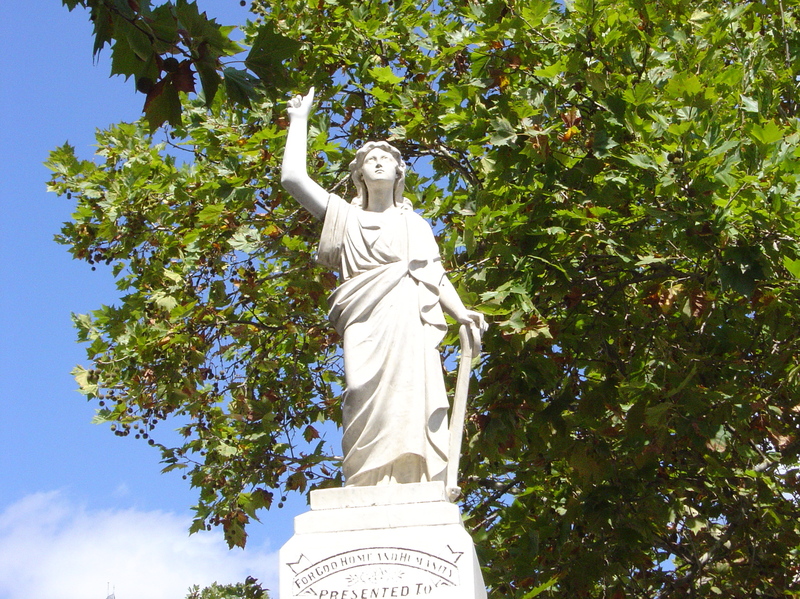 It was erected “In recognition of faithful service rendered by Thomas Ferguson, Secretary Melbourne Total Abstinence Society 1868-1904”. It was located in the centre of Russell Street opposite the Temperance Hall but was badly damaged when a truck hit in 1947. It is now in a much reduced form and safe from traffic in the middle of University Square, Carlton. Australians think of themselves as big drinkers and the impact of the temperance organizations on local politics have almost been forgotten. The memory of the Total Abstinence Society, the Women’s Christian Temperance Union of Victoria and the Independent Order of Rechabites survive in their drinking fountains. The Melbourne Temperance Society building is now a cocktail club. The various temperance organizations erected many of the more elaborate drinking fountains in Melbourne. 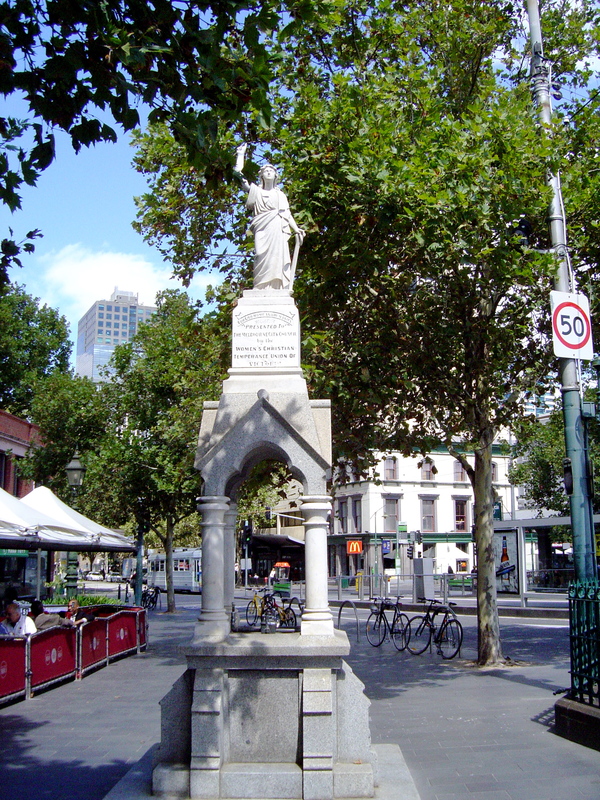 In 1901 The Women’s Christian Temperance Union of Victoria presented the Duke & Duchess of York with a Memorial Drinking Fountain, located in Victoria Square (corner of Elizabeth and Victoria St.) It is a stone drinking fountain enclosed by four turned marble pillars and granite canopy with painted gothic arches; on the top of the canopy there is a marble figure holding an anchor. 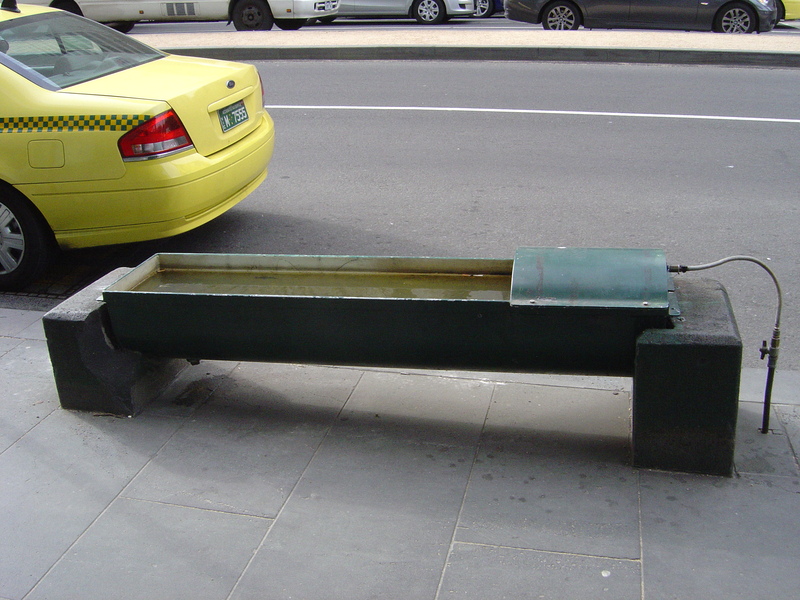 Between 1901 and 1939 memorial drinking fountains were popular in Melbourne, There are various memorial drinking fountains erected for city councilors although many are no longer functional. On of the last of the memorial fountains is the 1937 Samuel Mauger Memorial Drinking Fountain on Victoria Parade (near the Eastern Hill Fire Station) in East Melbourne. Samuel Mauger was a former Post Master General, a founding member of the Metropolitan Fire Brigade and the founder of the Anti-Sweating Labour League. The Anti-Sweating Labour League was not against perspiration, it campaigned for minimum wages and other working conditions in sweat shops. Elaborate drinking fountains ended with the era of the temperance movements and the increase in traffic. Post-1930 the taste in memorials turned to memorial fountains or pools and drinking fountains became less ornate; just a masonry pedestals supporting a basin and a Danks bubbler tap. The occasional memorial drinking fountain are still being installed, like the one commemorating a popular black swan named ‘Cookie’, who lived in the Alexandra Gardens and was killed in 1973. 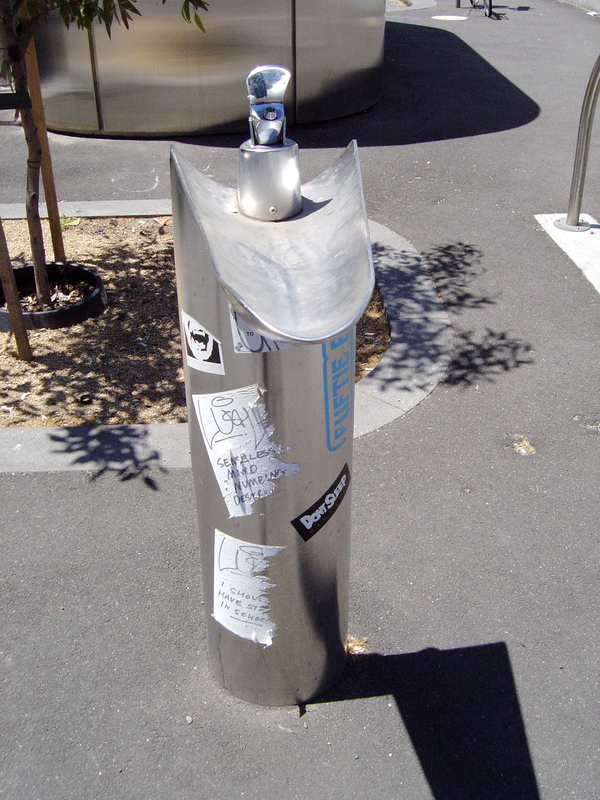 In 2007 Water campaigner, Patrick Jones raised the issue of a lack of drinking fountains in Melbourne again. This time the motivation was a green campaign against bottled water. Bottled water is basically pollution; transportation, packaging, disposal or recycling of water bottles all produces various types of pollution. Good sense prevailed and new drinking water fountains were installed around Melbourne. In the Bourke St. Mall and elsewhere you can conveniently refill you bottle at a filtered water dispenser beside the drinking fountains. And the quality of the water is excellent although at Federation Square some fathead has left their McDonalds drink-cup on top of one of the drinking fountains. This entry was posted on Sunday, September 1st, 2013 at 9:42 PM	and tagged with Andrew Brown-May, Carlton, Collingwood, drinking fountains, Independent Order of Rechabites, Melbourne, Melbourne City Council, North Melbourne, Temperance Movement and posted in Culture Notes. You can follow any responses to this entry through the RSS 2.0 feed. Walk past the North Melbourne fountain almost every day – didn’t ever pause to think it had a history, so thanks I now know it has a name. You’re welcome, it is surprising how many everyday things we know so little about.